Premium Video Booth ⋆ Video Photo Booth Rentals ⋆ GABZEBO INC.
At Gabzebo Inc. we design our videos booths based on 13+ years of experience. We are the original interactive video booth manufacturers and have learned what works and what does not. Our booths are designed carefully to balance usability for our clients and booth participants with optimized shipping, customization and on-site set-up. We are proud of what we offer and truly enjoy what we do. 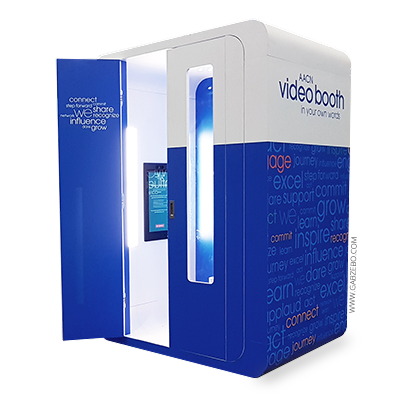 We have designed our latest release, Video Booth 4.0, as a modern FULLY AUTOMATED and simple design that can conform to any industry to be durable and easily branded. Up to three adults can present at once while seated to ensure comfort and maintain the subjects in the field-of-view in a controlled environment to accommodate different heights. Gabzebo can arrange the delivery and pickup of the video booth to your chosen location globally. We have partnered with an experienced freight company and customs broker for the past 12 years who are familiar with our video booths and who understand that event services and delivery are crucial to the timing of a successful function. The portable video booth is easily assembled by two people with one simple tool which locks each piece together. The booth requires a 5′ X 6′ X 7′ (including door swing) area and must have access to an electrical outlet and WiFi, if necessary, for social uploads. As well as being sturdy, the booth also breaks down into pieces to easily to facilitate ease of access, assembly/tear down, and transportation. This design allows you to position and delivers your message exactly where your target audience will be. Gabzebo supplies templates and art direction allowing clients to create their own imagery and personalize their overall vision for a full or partial printed vinyl wrap. Customize your interactive video recording booth with graphics for seamless integration with your projects, suit any occasion, attract attention and re-enforce your presence and objective. GABZEBO prints and wraps the booths before your event. The image wrap is removable and can be replaced to enhance your next project. GABZEBO booths are available for events globally and a discount is applied for the long-term and multi-booth campaigns. Please email us to obtain an estimate and learn more about our capabilities for your unique video booth project. Follow us to get the most up-to-date discoveries, Gabzebo events, and new technologies by ZEBO Labs. We also guarantee there will be a few posts from our team spilling coffee. If you have a custom display and only need our compact, powerful, all-in-one video recording technology, we have an option that will fit your needs. 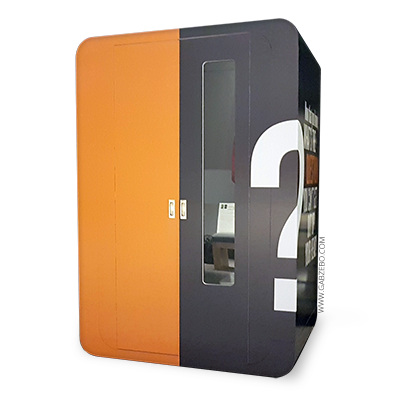 Our Zebo Video Kiosks offer the same robust technology found in our video booths and are extremely versatile due to its low profile, lightweight and generic design. We designed the kiosks for public spaces with an industrial 22" flush bezel touchscreen, free of exposed cameras, wires and tripods. 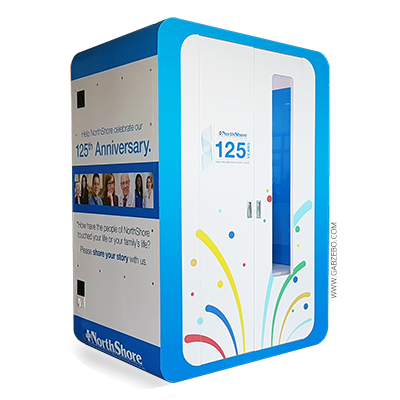 Our Video Booth Kiosks are ideal for wall mount, tabletop, or wide-angle photo booth applications. Built to be the all-in-one portable video marketing solution with the client and end user in mind. To learn more about video booth customization, contact us, and a Gabzebo team member will be in touch to discuss your project.